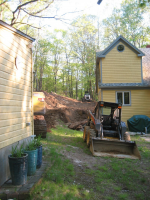 Started in the middle of May 2012 the hill behind the house was excavated about 15 feet into the side of the hill to terrace a road wide enough for a full size pickup truck to drive up the hill. The fill was used to widen the road further up the hill, and the one dozen trees removed were turned into firewood. 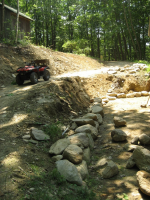 Two field stone walls were then constructed to keep the hill in place. 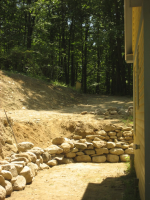 The hillside between the barn and well was graded to a steep slope and covered in crushed stone. The first wall is 40 feet in length and approximately 5 feet in height. It is split into two parts, with the higher portion forming two slight semi-circles that meet at the corner of the house. The space between the walls is filled with crushed stone and will contain small potted plants when finished in the spring. The second wall is still under construction. It will run from the shed to the artesian well head for a total of 120 feet in length. It will vary in height, starting at 3 feet, dropping to 2 feet, rising again to 3 feet, and then down to a single row of large flat rocks on the slope of the hill. As of the last week in October, the first 28 feet is complete.